Delta 1460 Lathe set up for 16 speeds for turning light metals, plastics, and woods. This is the standard Delta 1460 4-speed wood lathe outfitted with the optional counter shaft unit that converts the 4-speed lathe into a 16-speed lathe for light metal turning. The slower speeds are also ideal for large face plate turning of woods. The stand with the heavy cast iron legs is Delta Model No. 1463. 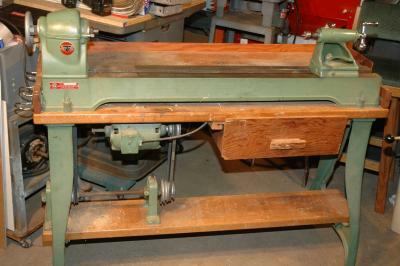 The lathe is powered by a Delta 1/2 HP capacitor start motor, 115 volts. Model No. 62-610. Tool Rest from Floor... 42"
Ball Bearings... sealed for life. In the photos there is a handwheel shown on the outboard side of the lathe. Does anyone know the part number of this piece and if there may be one available anywhere? Sorry Bud, you cant cut metal on that lathe. Maybe metal spinning, but not cutting.